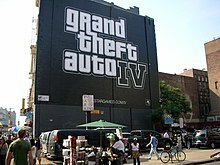 Grand Theft Auto IV's box art displays several characters, including Niko Bellic, Mikhail Faustin, Little Jacob and Johnny Klebitz. Grand Theft Auto IV has the same basic gameplay from the earlier games in the series. The player can walk, run, swim, climb, jump and use weapons and basic hand-to-hand combat. Players can steal and drive many types of cars, boats, helicopters and motorcycles. Players can explore and choose how they want to play the game. Players can complete missions, but these are not needed to get farther into the game to open content. When the player does a crime and the police see it, they will start to follow the player and try to catch him. ↑ Tanaka, John (2008-04-22). "GTAIV Heads to Japan". IGN. Retrieved 2008-04-25. ↑ "Full Cast and Crew for GTA IV". ↑ Thang, Jimmy (2008-10-30). "GTA IV PC Delayed to December". IGN. Retrieved 2008-10-30. ↑ Bramwell, Tom (November 10, 2008). "Grand Theft Auto IV Hands-on". EuroGamer. Retrieved 2008-11-10. ↑ "Grand Theft Auto IV on Steam". Valve. 2008-11-19. Retrieved 2008-11-21. ↑ "Grand Theft Auto IV". BBFC. 2008-04-01. Retrieved 2008-04-04. ↑ "BBFC removes GTA IV info from site". Eurogamer. 2008-03-31. Retrieved 2008-04-01. ↑ "Grand Theft Auto IV Game (Multi Platform)". 2007-12-13. Retrieved 2008-12-26. ↑ "Grand Theft Auto IV - PC Game (PC)". 2008-11-04. Retrieved 2008-12-26. ↑ "Decisions Database Summary - Grand Theft Auto IV". OFLC (NZ). 2008-02-27. Retrieved 2008-04-15. This page was last changed on 3 July 2018, at 07:44.